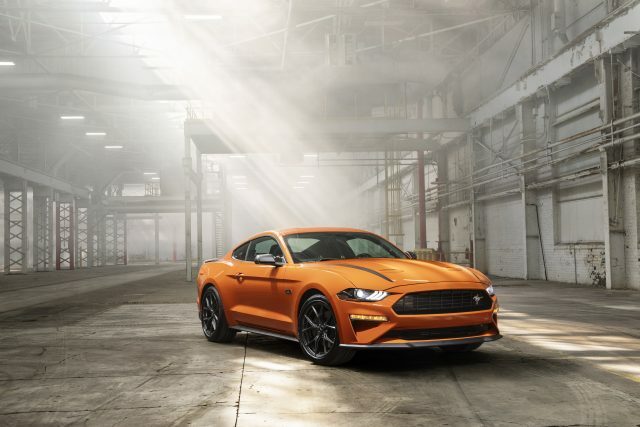 The 2020 Ford Mustang EcoBoost gets a shot of adrenalin for its 55th birthday courtesy of the new 2.3L High Performance Package. This package packs quite a wallop and gives the Mustang EcoBoost the distinction of being the most powerful four-cylinder sports car on the market by a domestic carmaker. The 2.3L High Performance Package delivers an expected 330 horsepower and 350 lb.-ft. of torque. It will be available with a 6-speed Getrag manual or a Ford SelectShift 10-speed automatic transmission. It’s expected to run from 0 to 60 in the mid-four second range and has a top speed of 155 mph. This engine first gained notoriety in the Focus RS and now gets to prove its mettle in the current Mustang EcoBoost. The package includes more than just a more powerful EcoBoost engine. The package also features a fully active quad-tip exhaust, larger four-piston fixed calipers with 13.9-inch front rotors from the Mustang GT, and a 32-millimeter sway bar in front and a tubular 21.7-millimeter bar in the rear. The package also includes a 3.55:1 limited-slip rear axle, special 19×9-inch aluminum wheels, and 255/40R summer wheels. There’s also an optional EcoBoost Handling Package available for the 2.3L High Performance Package. This package features semi-metallic brakes, MagneRide dampers and a TORSEN 3.55:1 limited-slip rear axle, wider 19-inch wheels with 265/40 Pirelli P Zero Corsa4 summer tires, and 24-millimeter rear sway bar. Pricing for the package has not been announced.